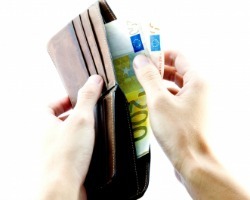 Pay less for your foreign money when travelling abroad. Our route to the best exchange rates for your holiday cash to allow you to get more for your money! One question we are frequently asked is "What is the best card to use overseas, or how can I get Euros from an ATM without paying through the nose for it?" The first thing to say is that we would suggest taking a couple of our recommended payment methods at least, as many can be obtained free of charge and this will give you greater flexibility should you have problems overseas. Losing a card or having your account stopped because the bank think a payment is suspicious can be very disruptive to your break if you only have one payment method. Stating the obvious but your first option is to take some foreign currency with you, though how much you want to take will depend on the level of cover your travel insurance gives you and your personal attitude to risk. Don't expect to get the best deal at an airport bureau de change or by walking into a bank. Do try our online comparison service to find the best travel money rates as the cheapest currency suppliers can easily save you £5 on every £100 bought through a high street bank. If you live or work in or around London or the home counties, you could consider a Metro Bank account. Metro Bank are a new bank launched in 2010, they started with a few branches in London but are gradually spreading further afield. Their current account comes with a fee free debit card, but you have to visit a branch to open an account. Their card allows free card purchases and cash withdrawals in Europe and a 1.9% transaction fee for the rest of the world. The outstanding best buys are detailed below, but the overriding rule is - use one of these cards for purchases and a prepaid card (see further down the page) for cash withdrawals. A top MoneyMaxim tip, if you have plans to use a credit card which either has no interest free period or charges interest on cash advances from the date of withdrawal, is to 'preload' your card. Credit your account before you travel, and you won't pay interest on your spending, as your account will be in credit throughout. You can always top up using online banking abroad as well! Overall the simplest card to apply for - no special requirements on where you bank, no charges anywhere worldwide, and a simple application process. No additional charges worldwide (as Mastercard don't levy the fees VISA do). Avoid using the Post Office Mastercard for cash advances. If you do, cash advance fees will be charged at 2.5% (min £3), and the cash advance interest rate is both significant and charged from the date you use the cashpoint - all of which can add up to a fee well over £10 if you withdraw €300 and clear the credit card a month later. With no foreign exchange fees or charges for cash withdrawals it sounds great - but preload the card so you can avoid paying interest on the balance outstanding. No currency loading or additional fees as it's a Mastercard which doesn't levy fees for using it abroad. Doesn't charge fees for cash advances either, but interest is charged from the date of withdrawals so pre-load the card. The interest rate is lower than that charged by many of its competitors, meaning an interest charge of £3 - £4 for that £300 withdrawal repaid a month later. If you can't pre-load, try to repay the debt as soon as you can rather than waiting for the bill to arrive. There is another catch, withdrawing cash using a credit card is an indicator of financial strain and we have heard reports of Halifax's automated systems kicking in and reducing credit limits so not one to use frequently. A complicated system here - you can earn credit for commission free transactions abroad by using your card in the UK - you can make a £1 fee free purchase abroad for every £5 spent here - and the tally is recorded on your statement. As we say complicated and if you use the card over your fee free limit it will cost you 2% in fees. Full details of the card are shown on our balance transfer pages, as it does have an attractive 0% interest free period for new cardholders. A fee of 2.5% will be charged for the cash advance (min £3), and again one of the higher rates on this page. Fees for a €300 transaction paid back a month later would be about £13.20, and for a similar sized transaction outside Europe it would be around £15.90. Our two best buy cards are the CaxtonFX card and the Fairfx card. Both are available in Euros or US $ - and can be loaded at a pretty competitive rate. Fairfx normally has a slightly better rate, but Caxton doesn't charge for cash withdrawals so it's a bit swings and roundabouts - both rates are normally better than the best exchange rates you can get for notes. They can either be used for purchases, or, in the case of a CaxtonFX card, at cash point machines free of charge (although in our experience some overseas machines, particularly in the US, charge a nominal fee as well). Useful if rates are falling as you can lock in your money at a higher rate now and spend it in the days to come (if of course you are a financial whizz kid who can predict the markets!). Both the main two cards are offered free of charge (charges apply elsewhere) through MoneyMaxim's pre paid currency credit card article, and given the pre-paid nature of the card credit checking is far less stringent than for 'real' credit cards. They can be easily topped up abroad from your bank account if you have access to the internet. Although these cards do not offer the same consumer protection that credit cards do - if the Bank or Building Society that issues the card runs into difficulties your cash could be at risk - Newcastle Building Society who administer both have said that any funds on them are 'ring fenced' for customers. However, if you are looking at buying an uncomfortably larger amount of money we recommend you consider getting a few cards from various suppliers and spreading it between them.